Ooh! 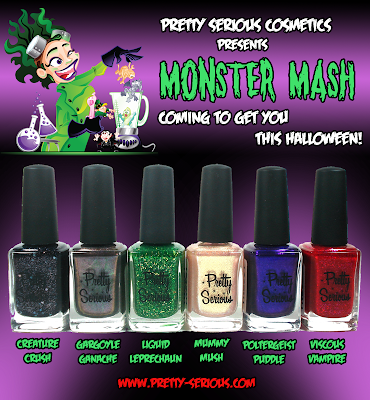 Pretty Serious is doing their very first Halloween collection and it looks pretty awesome! Here's a copy of the official press release! 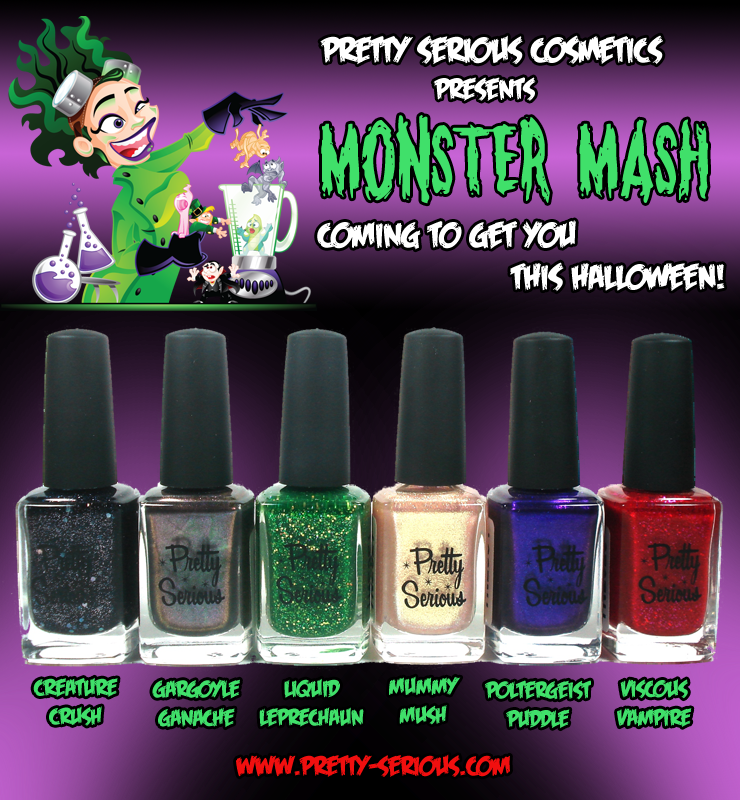 Pretty Serious Cosmetics is proud to present our Halloween 2012 collection - MONSTER MASH! We've got six amazing new shades to help you get your scare on this Halloween! GARGOYLE GANACHE - a multichrome shimmer with flashes of green, gold and purple through a stony gunmetal base. If that wasn't amazing enough, our new Halloween shades will be packaged in sensational new holographic green boxes with new Halloween art by Leigh Young! These fabulous freaks go on sale at 9am AEST, October 10th from http://www.pretty-serious.com. RRP is $9.95, with a 10% discount for buying all six shades! Pretty Serious Cosmetics also ships worldwide. Check out our site for more details. *Hair of the spider was graciously donated by Salon Arachnidé, the premier spider beauty destination. **And of course we're talking about vegan eye of newt substitute - Pretty Serious is always totally Vegan and Cruelty Free! Seriously cool! This is a beautiful collection. Wow. I'm getting addicted to your nail blog, Scrangie! You always have the best posts. I'm loving the look of that gargoyle one. And looking forward to seeing the puddle one swatched, it sounds beautiful. The names of these polishes just make me happy. Every time the phrase "radioactive green" is used, God kills a kitten. Mummy Mush looks interesting - reminds me of my HG Del Sol Sassy based on the pic here! Definitely ordering the entire collection! I'm starting to love indie companies! LOL at "the premier spider beauty destination" and "vegan eye of newt substitute" !! I think I need Liquid Leprechaun!